A large number of the staff members had gained Associate Fellowship or Fellowship of the HE Academy through the University's long-standing Postgraduate Certificate in Higher Education (PGCHE). 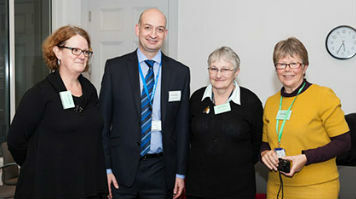 Among those congratulated were also LSBU's first Senior Fellows: Ruth Brown (Academic Staff Development Unit), Anne Harriss (Course Director, Occupational Health Nursing), Gail Langley (Reader in Educational Development), and Kate Leonard (Course Director, MA Practice Education and Teaching). Having already achieved Senior Fellowship himself, the Vice-Chancellor challenged the audience to become LSBU's first Principal Fellows—welcoming not only the individual benefits of such awards, but their importance to the University's standing and ability to deliver a high-quality student experience. Prizes were also awarded for the best posters demonstrating the practical projects undertaken as part of the PGCHE, celebrating the positive impact of such research on learning and teaching at LSBU. The winner of this year's prize was Vicky Hilborne from the Department of Applied Science - runners-up were Anne-Marie Langan (Allied Health Sciences) and Liz Whelan (Medical Architecture Research Unit).